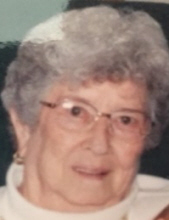 Mildred Will Shull Eberly, of Dayton, passed away on March 22, 2019 at Autumn Care of Mechanicsville. She was born on January 13, 1925 and was a daughter of the late Fred and Carrie Neff Will. She was a long time resident of Dayton and was the treasurer of Dayton for many years. She was married twice, first to Earl A Shull and then to Marion E. Eberly, both who preceded her in death. She is survived by her daughters Carolyn Early and husband Richard and Joan Hollen and husband John; four grandchildren Beth Doughty (Nate), Kris Reece (Brad), Will Shoemaker(Theresa) and Taylor Shoemaker. In addition, she is survived by six great-grandchildren . Also surviving are two sisters; Bernice Garber (Chuck) and Katy Roudabush (Ronnie), brother-in-law Frank Rhodes, and nine nieces and nephews. She is also survived by stepchildren; Ava Griffin, Fred Eberly (Karen), Robert Eberly (Elaine), Buddy Eberly (Karen) and Mandel Shenk and their families. Preceding her in death in addition to her parents and husbands, are two sisters, Mary Moats and Arlene Rhodes, and three brothers; Roland, Tommy and Donnie Will and his wife Cheryl; stepdaughter, Lelia Esther Deputy and a stepson Willie Eberly. A memorial service will be held on Monday, March 25, 2019 at 11:00 AM at Johnson Funeral Service in Bridgewater with Rev. Hollis Dodge officiating. Burial will be private. The family will receive friends on Sunday, March 24, 2019 from 7:00 to 8:00 PM at the funeral home. In lieu of flowers, memorial contributions may be made to the St. Michael's United Church of Christ PO Box 101 Bridgewater, VA 22812. To send flowers or a remembrance gift to the family of Mildred Will Shull Eberly, please visit our Tribute Store. Rev. Hollis Dodge officiating. Burial will be private. "Email Address" would like to share the life celebration of Mildred Will Shull Eberly. Click on the "link" to go to share a favorite memory or leave a condolence message for the family.